After six years as a criminal lawyer in Romania, Gabriel Stefan Totolici wanted to take his career in a slightly different direction. "I had completed all of my education in Romania, studying my LLB in Law at Bucharest Ecological University and going on to earn my full licence to practice law with the Bucharest Bar Association," he says. "Although I enjoyed working as a criminal lawyer, I wanted to explore new horizons and had always thought about studying for a Masters degree." 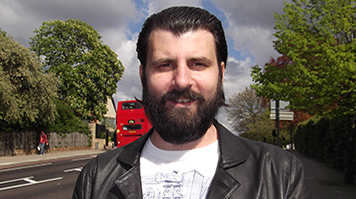 Stefan, as he prefers to be called, began researching universities in England and decided to investigate the possibility of studying at LSBU: "As a self-funded student, I was always going to find myself in the situation of having to save up to pay my tuition fees, and I also knew I would have to work while I studied. That meant London was a strong contender for me, with plenty of opportunities to work while I wasn't studying. I moved to London, and began looking for the right place to help me make the change in my career I was looking for." It was an Open Day at LSBU that finally made up Stefan's mind. "I was really impressed with the Course Director," he says. "The staff on the course I was interested in – MSc Criminology and Social Research Methods - were clearly very knowledgeable and passionate, and I immediately had a good feeling about studying here. When I investigated further and discovered how good the employability prospects are for LSBU graduates, I knew that it was the right choice for me. The fees were also very reasonable so when I took everything into consideration, it was very clear to me that I should apply." Since starting on his course, Stefan has been delighted to discover that we have delivered on his expectations. "I think the best thing about studying here is definitely the quality of the teaching," he says. The lecturers here really do go above and beyond – the help that they provide during the entire course is excellent and I cannot praise them highly enough. Stefan is now looking forward to completing his studies, and plans to make the most of the excellent networking opportunities and our reputation within the industry. "Once I have finished my degree, my aim is to find a job in the criminology or criminal justice area here in the UK," he says. "I'm very optimistic about my chances and feel that my experience from my time in Romania coupled with the outstanding education I am receiving at LSBU are helping to get my new career off to a great start."